Mi Bandera, a Mexican/Dominican restaurant, is perhaps not the easiest place to go through the process of getting a meal. It’s of the ‘restaurant in a grocery store’ genre, which in this case means that the cook acts as server and basically otherwise fulfills all of the other roles (including bus boy and dishwasher) that one might expect in a restaurant. Consequently, service can be leisurely – and as far as we can tell they don’t speak a lick of English on the restaurant side. First, as you enter the front doors of the grocery, turn right and look for the seating area. When there, you should see a prep line (with a kitchen further back) and a long vegetable cooler on the opposite side. Go to the counter with the heated food case (in front of the prep line) and put on your best ‘I’d like to order’ face. Then, wait for the cook to take notice. He’ll probably make eye contact well before he’ll take your order. This is how it goes here – at this point, faith in the deliciousness of the end experience may be useful. Once he comes to take your order, he’ll probably ask, “aqui o llevar?” This means ‘for here or to go’. If you’re eating there, respond ‘aqui’ (ah-KEY), and for ‘to go’, ‘llevar’ (yay-VAHR). Now, place your order. We’re going to direct you towards one failsafe dish – ‘chuleta de puerco’. Say ‘chew-LAY-tuh day PWER-koh’, and follow with ‘por favor’ (pore FUH-vore, this means ‘please’). Next, take a look at the beverages at the end of the heated food case in the cooler, or if the selection there seems too limited feel free to go to the grocery side and look at their more extended offering. I’m partial to the Foco coconut juice, but anything goes. Once you’ve got your drink, find a seat on the restaurant side and take in some of Telemundo or similar being shown on the TV. Note how the cook might occasionally come out to the vegetable case to pluck a pepper or some onions for your dish. As the dish comes out, you should expect 2-3 thin-cut pork chops (quantity depends on size of chops), beans, rice, lettuce, and avocado on a large platter, and a basket of tortillas on the side. Cut a few generous slices of pork (don’t remove the fatty edges – they’re the best part!) and put them on a tortilla. Add some beans, and really just about anything else on your plate you’d like. Fold the tortilla up like a taco, and enjoy. The pork chops have a smoky, almost vaguely bacon-y flavor, and the beans are as rich and delicious as any we’ve ever tried. Upon first tasting it, one of our friends declared Mi Bandera to be her ‘new pork chop place’, and we’re pretty sure she’s been back weekly. Come to think of it, we probably have as well… they’re that good. Hope you thought so as well. Having finished your meal, now go back to the food case and ask for the check. The word ‘check’ is usually understood, but a sign language pantomime of writing with a pen on a pad will work as well. Take this check to the check-out line in the grocery and pay there. With that, you’re no longer a Mi Bandera rookie. Probably a good time to let you know that while Mi Bandera is heavy on Mexican offerings, they’re Dominican run and also serve island specialties such as maduros (ripe plantain), tostones (unripe plantain, smashed, fried, and salted), and Dominican empanadas. 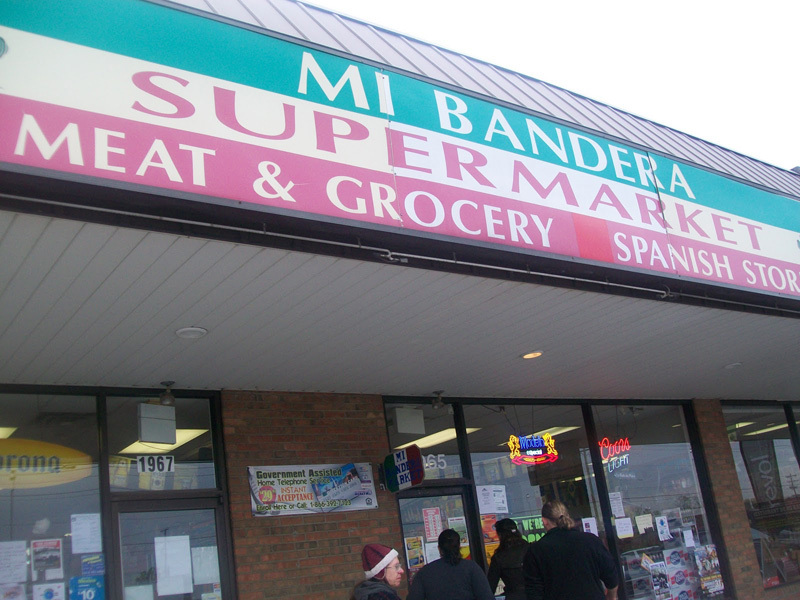 By and large, Mi Bandera is not a stop that caters to vegetarians, with the possible exception of a few side dishes such as the plantain preparations. Prices are reasonable, with all dishes we’ve tried coming in well under $10. This entry was posted in Latin American, Mexican. Bookmark the permalink. Do you have an address for us? Sorry about that – the post is now updated with location & hours at top. Stopped in today for late lunch. No problem ordering-guy spoke great English (great, since I don’t speak much Spanish!). Food was worth the (brief) wait, and didn’t dissapoint! Chicken and beef tacos were delicious; served with cilantro and onion, lime wedges, and radish slices. Chicken burrito was bigger than a Chipotle, much much tastier, and cheaper too! Fried egg plate with rice and beans was so flavorful–I don’t know what spice was on the eggs, but they were perfect. Basket of warmed corn tortillas to the table with the meals, and tasty red (mild) and green (spicy) sauces at the table. We’ll definitely return. It’s a great alternative to taco trucks when you just don’t want to eat in the car! I stopped in today, and it appears they no longer do sit down dining. All the tables had been stacked and buried with stuff. So now it’s just a grocery .